Extron, Inc., (ExtronInc.com) announced today that it will be featured on the cover of the September/October issue of Manufacturing Today, one of the manufacturing industry’s leading publications. The magazine will highlight how Extron’s Last Mile Manufacturing capabilities are changing the conversation around domestic manufacturing. 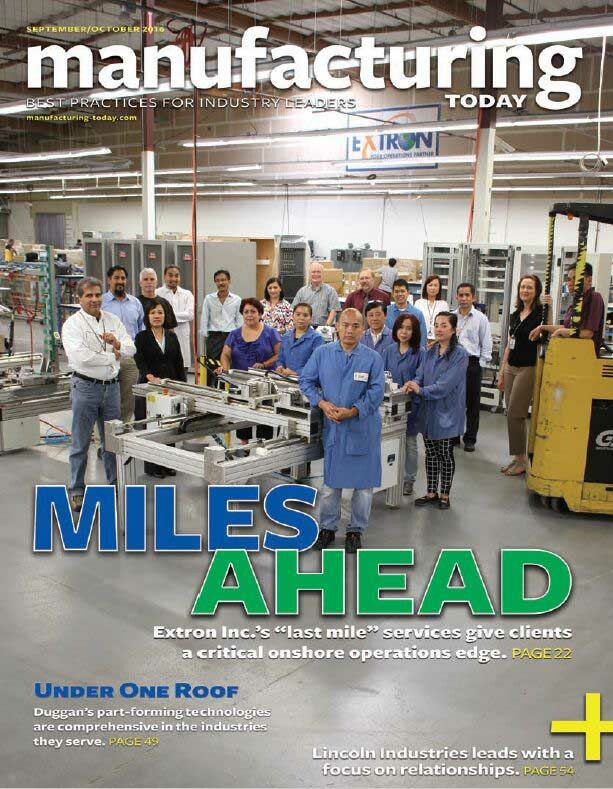 The Manufacturing Today article (also available here) highlights how Last Mile Manufacturing (LMM), Extron’s unique approach to domestic manufacturing, can help customers keep more of their supply chain in the United States, while still taking advantages of global sourcing. The story describes how Extron clients are benefitting from faster and more flexible response to dynamic customer demand, as well as reduced inventory and transportation costs. Extron’s LMM approach also results in improved protection of valuable intellectual property (IP) which becomes less exposed to theft from overseas factories. “There is an outdated belief that making anything overseas is cheaper,” said Duggal, “so we love it when we have the opportunity to demonstrate how the economics change when you use Extron’s LMM approach. More and more customers are inquiring about this approach. Extron, Inc., is a leading high-tech manufacturer offering solutions designed to improve supply chain cost, flexibility and risk exposure. Extron’s 120,000 sq. ft., ISO 13485 & 9001:2015 Certified facility is located in Milpitas, CA, producing product for Fortune 100 companies in medical, aerospace, defense, technology, communications, and automotive. Extron provides on-demand product configuration in close proximity to the distribution channels, helping its clients reduce manufacturing cost, maintain control of IP, respond faster, and reduce risk. Extron also provides returns management solutions, demo-loan product evaluation solutions, and retail fulfillment services. Visit extroninc.com.